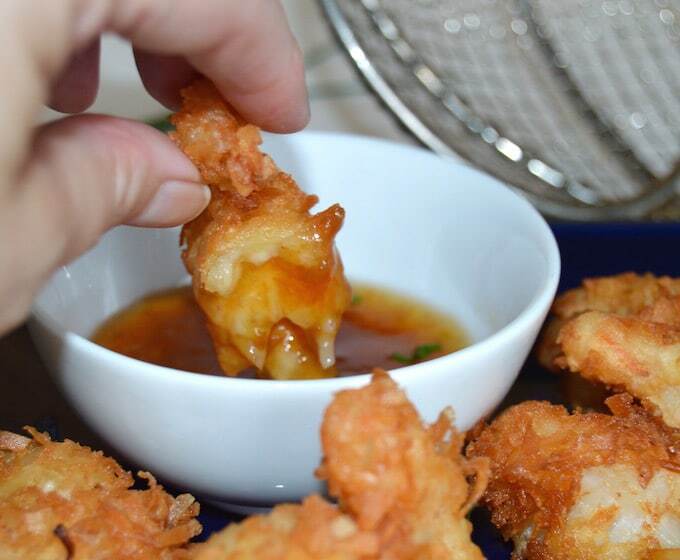 You are here: Home / APPETIZERS / Simple Coconut Shrimp — Crunchy, Juicy and Delicious! Simple Coconut Shrimp — Crunchy, Juicy and Delicious! 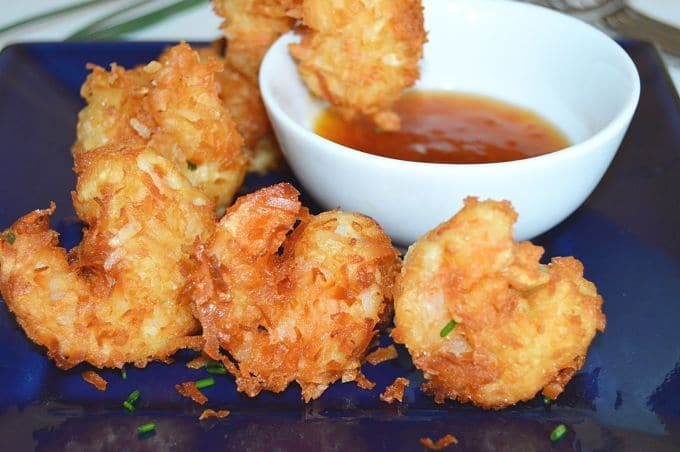 Simple coconut shrimp that taste even better than what you get at a restaurant. They are juicy on the inside, crunchy on the outside. 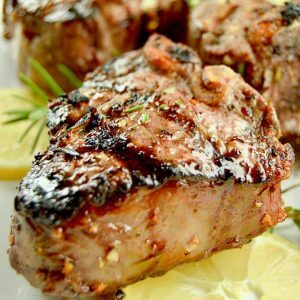 A must make for a casual dinner along side a salad or as an appetizer with your favorite tropical cocktail! 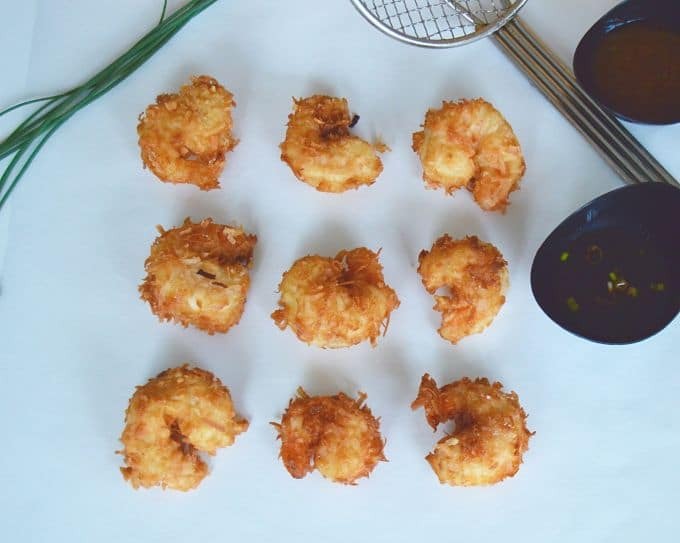 These Simple Coconut Shrimp are delectable! They are juicy on the inside and light and crunchy on the outside. Using beer and baking powder give the coating a very light feel so you don’t feel like you overindulged after eating them. The baking powder is the secret behind tempura, these aren’t as light as tempura but are so much lighter than most fried shrimp recipes. 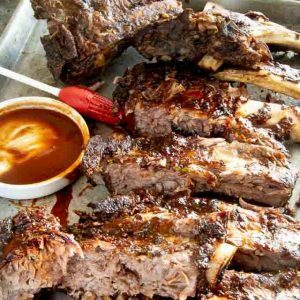 This recipe is adapted from a cooking class I took with Jet Tila. Now he’s a world famous chef who appears on the Food Network all the time and has several restaurants including Stir Market in Los Angeles. When I took his class he hadn’t become famous yet. He’s amazing to learn from. He has this infectious attitude that makes you LOVE him and his cooking is out of this world. Everything he makes is delicious and has the added bonus that the recipes are usually pretty easy to make. We eat a lot of fake-out takeout recipes at home like this Spicy Thai Shrimp Soup or these better than a restaurant Steamed Chinese Dumplings. The Coconut Shrimp are perfect for a meal served along side a salad. They fit with my ideal motto for food….taste great but aren’t overly filling and easy-peasy. The Shrimp recipe is Jet Tila’s, but the sauce is mine. I love that I can make these ahead of time. It makes it easy to prepare them early in the day up until they are ready for frying and then chill them until I’m ready to make them. We ate these Sunday when we had been out most of the day and came home and had them for a light dinner. And yes we had them with a Mai Tai. 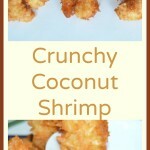 Crunchy, simple handmade coconut shrimp! An excellent choice for easy appetizers when entertaining! Parchment paper lined tray to fit fridge to chill coated shrimp. In a small bowl place egg and beer and mix thoroughly. In a medium bowl mix 1/2 cup Flour, baking powder and salt and whisk until blended. Add egg/beer mixture to flour mixture and combine completely. Dip shrimp in dry flour, then wet flour mixture. Be sure to let excess flour mixture drip off before then dipping it into the coconut mixture. Press the coconut into all crevices of the shrimp. Place onto parchment lined tray. Fry shrimp in small batches, turning once for 2 - 3 minutes. The shrimp should gradually get golden brown. If your oil is too hot they will brown as soon as you drop them in and then the center will be partially raw. I use a spider to remove them from the oil to maintain as much coating as possible. I also use the spider to remove any excess crumbles in between shrimp batches. 1. In the pictures you see, it is sweetened coconut. But unsweetened works just as well. This coconut is what I had on hand and I liked the long lengths of the coconut when it was fried. It made the shrimp look even better. 2. Set up your dipping station is the order you will be dipping them. So in this instance you will take the shrimp, dip it into the dry flour, then the wet flour, then into the coconut to coat and finally onto the pan to place in the refrigerator. Use one hand only to dip the shrimp so you always have a clean hand available. It sounds silly, but it will make your life easier. 3. Do not skip the chilling step. The coating will fall off in the oil if you do. If you want to make these ahead of time, make them up to the chilling of coated shrimp. You can chill them in the morning then fry them when you are ready to eat! Nutritional and Caloric information is calculated using My Fitness Pal using ingredients/brands I used to make this recipe. Your caloric info will vary according to the brands you purchase to use. Please take this into consideration if you are following a strict diet. Dipping sauce for Coconut shrimp, wontons or as a mix for a salad dressing. Add all ingredients except green onions to small sauce pan. Remove from heat and place in serving dish. Add green onion garnish at the last minute before serving. « Football Party! Baked Chicken Wings! Yum! 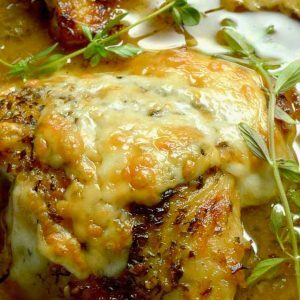 I love coconut chicken (don’t much care for seafood) but my husband would LOOOVE this so much! Pinning for him! I bet this would be great with chicken! Great idea!! Hope your husband likes it!! ooo those look awesome! I think I might have to try this recipe. I have to be honest, I have never eaten shrimp before. This looks like it would have just the right texture so I think this might be the recipe to test shrimp out with. I am a vegetarian but my friend adores shrimps and coconut so he will enjoy this I am sure! This is definitely I dish I would like to have every day, love coconut and shrimps. The sounds also looks delicious. I love LOVE coconut shrimp. Even though I am not a huge shrimp fan, add coconut and I am there! I love seafood especially shrimp so this looks like a great combination ! I love how you have organized the recipe as well! Such talent in cooking! Oh I bet my husband would love this. He’s the shrimp fan in the family, so I wonder if I were to make this if he’d really enjoy it. I bet he would, totally something he would like. Looks good. Thanks Jeanine! Let me know how it turns out for you! This looks so good! One of my favorite food splurges! I can’t wait to try your recipe! I don’t eat meat/seafood but that doesn’t stop me from making it for my family. They will love this. Thanks. These would make a great game day snack! I know a few people who would LOVE these! Yummy! I would probably eat way too many of these! This looks amazing! Been awhile since I’ve had some nice coconut shrimp. I have been craving coconut shrimp! I have to try this recipe… and soon! These shrimp look entirely too delicious! This looks delicious. Love the idea of beer in the batter. Perfect flavor I imagine. I’m in the market for a wok – appreciate your advice on what to purchase 🙂 Beautiful shrimp and that dipping sauce sounds delicious! What a great idea to use coconut flakes. I’m going to try this soon. Wondering if I could do seltzer water instead of beer. You had me at Coconut Shrimp. And how awesome is it that your got to learn from Jet Tila. Thank you for sharing the recipe and all of the other great insights you learned from Jet. I can’t wait to make these for my family. My family requests this…hope yours enjoy as much as we do! *squeal* you had a chance to take a class from JET TILA? Whooo-hoo! That’s super cool. My kids like coconut shrimp a lot but cannot have peanut oil. Have you tried frying it with other oils, do you have any recommendations? Ive used coconut oil as well as vegetable oil with success….try one of those and it should work just fine! Let me know what you think! This reminded me of the coconut prawns I used to make years ago when I had a catering company. It looks delicious and I can’t wait to try this recipe. 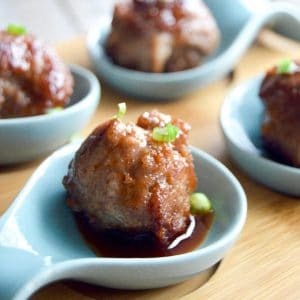 Im making them for a party Im catering for over the holidays….great minds think alike!! Thanks Dee! I agree, we don’t have it as often as we should either…I need to work on that! Prawns and coconut Yum. But that apricot ginger dipping sauce is amazing!!!! Ange- the apricot dipping sauce also works well on sandwiches! You won’t be disappointed! Here’s to Island time!